for a few days in the area. The town of Puerto Natales is often overlooked as a destination because it is solely used as a stop-off, on the way to Torres del Paine National Park. However that isn’t totally fair. The town is located in a beautiful, wild, wind swept location. The first picture below was taken from the waterfront in town. The mountains you can see are stunning; perfectly snow capped and they extend in every direction. I imagine the town’s frontier and wilderness feel is lost when it is overrun with summer tourists desperate for a room and to get on the next bus to the park. However the colourful shacks, slow pace of life and the end of the world feel in winter was pleasant enough to pass a couple of days In fact it had a pretty similar feel to the wonderful Castro on the island of Chiloe. A lack of a decent bakery was the places main downfall where there’s good cake there’s happiness.When towns are big tourist stop-offs they always seem impersonal and soulless. The locals understandably tend to see a dollar sign and not a person when you roll into town. Pucon, Chile and El Calafate, Argentina were two of such places. However Puerto Natales seemed to have a slower pace of life than some of these places, and this made it more tolerable, especially combined with the quiet winter when the big scramble for getting tourists on your tour hadn’t started yet. I would definitely recommend trying to catch or charter a boat to some untamed and remote point the other side of the inlet from town. A few tours like this were offered in the summer, however it can’t be that hard to ask a few locals, get a map and plan your own end of the world adventure. Any hike in that area would be truly wild hike among the soaring birds, pristine glaciers and remarkable mountains, just a boat ride away. We were now getting to know Nancy from Nancy’s Hostel fame and her family quite well. The hostel, like the town was pretty empty, we were the only people visiting the hostel, who had actually stuck around more than a day after seeing the park (OK so it was dentistry not the scenery that kept us!). Nancy we discovered enjoyed watching soap operas, doing her kids homework, cooking great food and even spent one day hacking up most of a cow on the small kitchen table, the head was in a bag in the sink, it was a bit of a shock when Marion, a vegetarian went to start cooking! Hygiene standards might have had a question mark! We sorted ourselves out a bit which included finding the one and only self-service laundry in Chile, however the lady working there couldn’t bear to watch us do our own laundry so she did it for us anyway, even so much as putting the coins in the machine for us! That’s what I love about Chileans, super kind, friendly and genuine people. Nothing is too much effort. After the head in the sink incident we decided to take a couple of days to head south to Punta Arenas, the most southern decent city on the South America mainland. 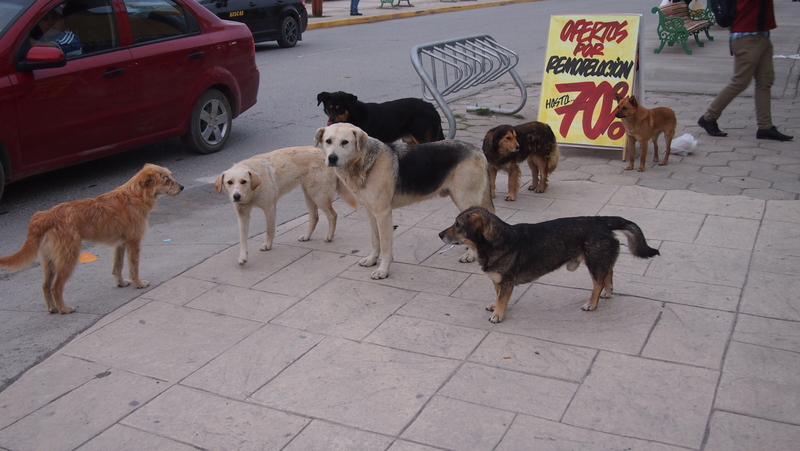 Like any small town in Chile the main street was being cruised by a pack of dogs. These were a particularly cool gang. None of these dogs were mangy or aggressive, they looked well fed and were often pure bred fancy breeds. The picture below was of cool and gang, the one in the middle was the president of the gang (is that the correct terminology for gangs? ), the one on the left was nicknamed ‘Scout’ as he often went ahead, a bit of a lone ranger within the gang. The back one was the security or ‘the heavy’ as the president referred to him, he was the tough one. The others were fairly forgettable. A few ugly sausage dogs were found wandering the streets on their own as the hadn’t made the cut to join the gang it seemed. The main attraction of Punta Arenas is not stray dogs but the penguins. We were a bit early for prime penguin viewing season, as technically all the reserves were still closed. There are Magellanic penguins at Otway Sound Penguin Reserve and way more on the Isla Magdalena y Marta, King penguins can be seen on a long day trip that crosses the short distance to the island Tierra del Fuego. The island was inaccessible but we signed up for a tour to the ‘closed’ reserve. This involved a walk along the beach to view the penguins who had arrived to breed already. However what they didn’t tell us was this was all a bit shady. The tour drove down a dirt track to the beach and then our friendly tour guide drove past old fisherman’s shacks on a rough tyre marked track in the dunes across streams balancing on drift wood to cross rivers until finally being defeated by a huge torrent. Here we got out and started the walk, this involved more balancing on drift wood above rivers, a few fences jumped then detour along beach to the sanctuary. The guide was looking around in a fairly shifty fashion as we approached the sanctuary by the ‘back door’. This added to the feeling this tour was not entirely legit. It was myself Marion and a Mexican girl, who seemed horrified by the fence jumping aspects, and clearly didn’t realise what she had signed up to. We did see penguins though, lots of fun penguins, not in the 10,000s like some places but enough. After some stalking of the birds and lots of photography. We set off back and the pace was like a steady jog as we escaped trying not to get caught it seemed. The poor Mexican girl sounded like she had run a marathon as we approach the car! It was certainly an adventure tour as we pushed the car stuck on the pebbles to get back out again!